The newest Eton Satellit has no model number after the name…it is known simply as The Eton Satellit. It is quite a departure from previous Satellits such as the most recent Satellit 750, the earlier Satellit 800 or the Eton E1. The Satellit name was given to Grundig AG Of Germany’s top of the line portable radios beginning with the 1964 introduction of the Satellit 205 through the Satellit 700 offered between 1992 – 1996. Formerly known as Lextronix, Eton of Palo Alto, California acquired rights to the Grundig and Satellit names, and sold a rebadged Tecsun HAM 2000 as its Grundig Satellit 800 Millennium. That was followed by the Eton E1 which many (myself included) feel is the last great radio of the line, even though the E1 was not called a Satellit…it was cosmetically designed after the never-introduced Satellit 900 and continued the tradition of high-end portable radio design. 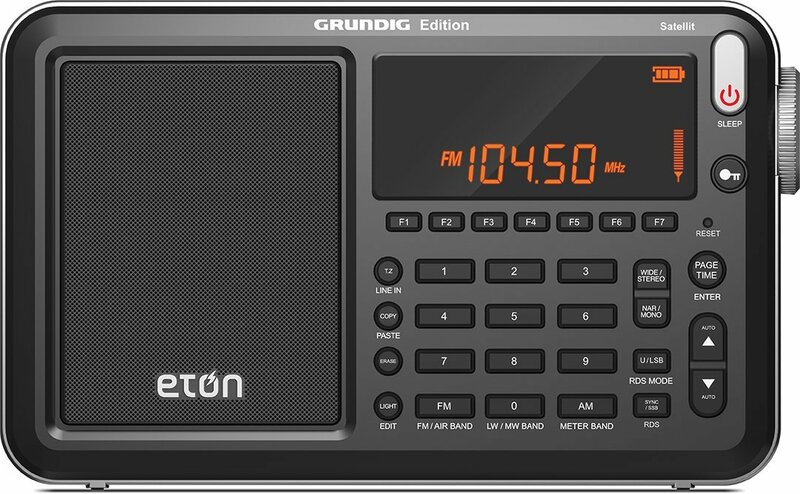 The Eton/Grundig Satellit 750 was a rebadged Tecsun S2000, sold for about $200 less than the previous models, and has many devotees. If you read my review you’ll see that I consider it a decent, if not stellar performer. But at least it kept to the original Satellit concept as far as form factor…a radio-lover’s radio with capabilities that bridge the gap between a portable and a table top set. Eton has had its share of successes and failures as far as shortwave portables are concerned. 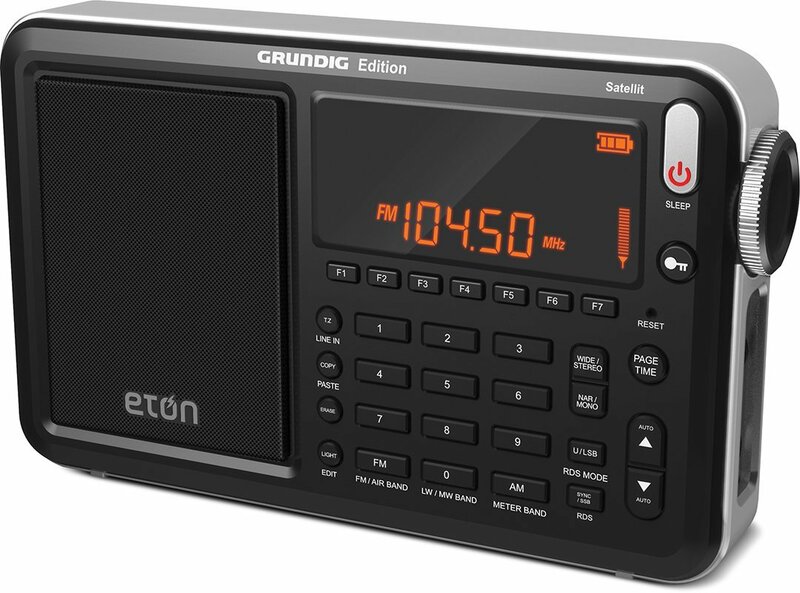 One of my favorites was the Eton E5/Grundig G5…identical except for the name and color. Based on Degen’s DE-1103 (which is still available) the E5/G5 were top performers in their size/price class. 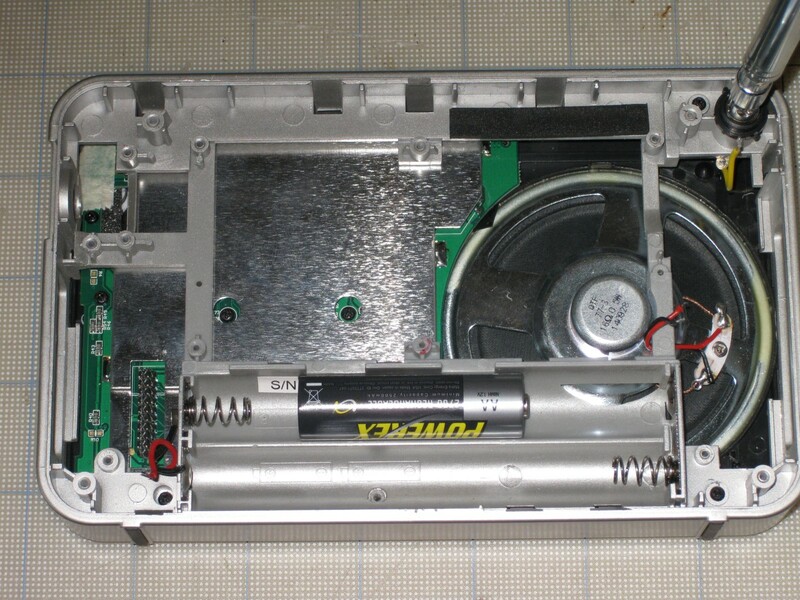 The subsequent Eton/Grundig G3 however can only be described as a catastrophic failure…it had the worst defect rate of any radio I can ever recall. After returning several bad ones I had a chance to check out a dozen of them at a conference a few years ago and found only one or two that seemed right on all counts…just unbelievable. However the Satellit 800 and Eton E1 both are generally acknowledged as serious radios with performance as good as portables get. So it was with some surprise that I opened my new Satellit to discover how small and unassuming it is… only 6.6 x 4.1 x 1.2 inches. This makes it considerably smaller than the E1, Satellit 750 or any of the previous Satellits, and smaller even than the popular Tecsun PL-660 and PL-880, but the same size as the E5/G5 and G3 series. So what is packed into this relatively small package? Let’s take a look at its basic specs and features. 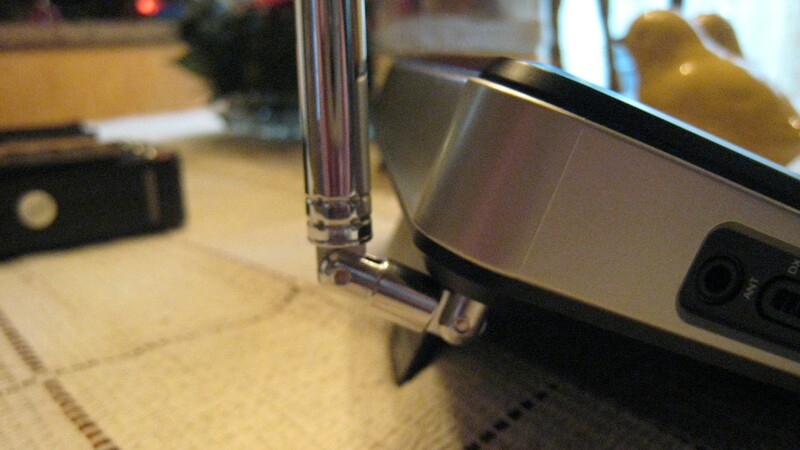 I also noticed something very unusual…the rod antenna has an extra joint near the cabinet (see picture). This allows the rod to be swiveled all the way up to vertical even when the radio is inclined on its kick stand…an unusual but effective feature. As with most modern day digital radios there is a small learning curve with the new Satellit. 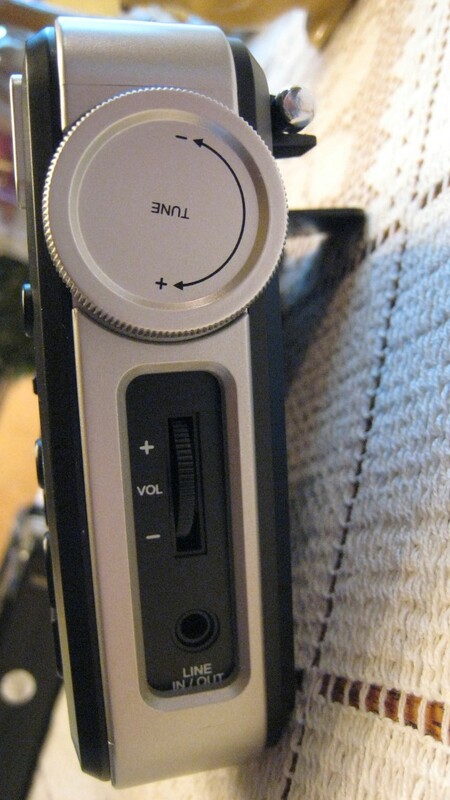 Also, as I found with the Eton Traveler III some button presses are not described clearly in the manual…the most obvious are the On/Off and Light buttons The book says a Quick Press turns the power on…but that is only true if you have already turned on the display light first. Otherwise the first press of the Power button turns the light on and the second press turns the radio on. The Light button itself it unusual and works similarly to that in the Eton Traveler III. It operates whether the radio is on or off. If you just turn the radio on, the display will illuminate automatically as on most radios, and extinguish after several seconds. That is Auto mode. But if you press the Light button more than once, it toggles through the brightness levels and off, then back to bright. Now it will stay on permanently until you turn it off. I like the ability to keep the lights on the whole time I’m using the radio but you could also drain the batteries if left for a long time. These are things you can figure out with a little time spent. So read the manual…keep it with you as you do your initial set up…after that operation is mostly intuitive and straight forward. Another comment about the new orange display used on all of Eton’s new radios. It is eye catching and cool but unlike traditional displays, when the light is off you see nothing. It is eye popping indoors but not so visible outdoors. Performance: This new Satellit arrives after much hype and speculation, but how well does it perform? It was obvious from my initial impressions that this new Satellit would not compete directly with the older Satellits or the Eton E1 (nor would I expect it to at less than half their price). For one thing its Aux Antenna jack works for SW/FM/Air but not AM…the other radios allow flexible antenna inputs for all bands. The older, larger radios also have “bigger” audio, more control facilities and are more substantial radios physically. It seemed more reasonable to compare this new Satellit, which lists at $220 but is generally available at lower prices, to today’s best and some recent top portables. 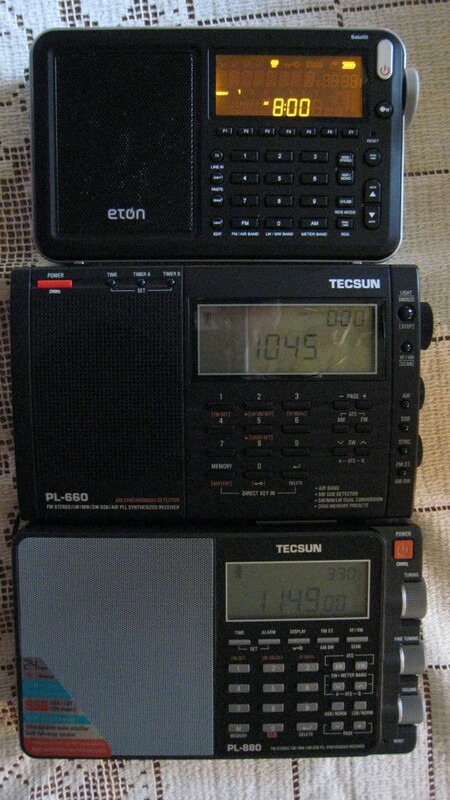 I felt this new model deserved as complete a set of comparison tests as I could reasonably handle so I compared it with many radios including the Tecsun PL-880, PL-660, PL-680, the (sadly) discontinued Eton E5/Grundig G5, Sony 7600GR, Grundig Satellit 800 and Eton E1. I compared them with their built-in antennas and on two external antennas…a Wellbrook ALA-330S and a 40 foot random wire. First the Good News: AM Reception: Here the Satellit performed admirably compared with the other same-size portables. 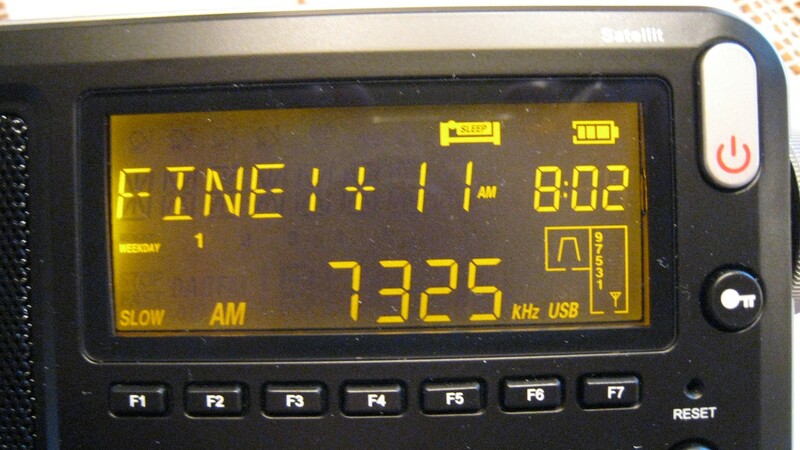 I compared the radios at midday on several successive days using 17 AM stations covering the whole AM band. The Satellit matched or beat PL-880, PL-680, PL-660 and at least matched the 7600GR on virtually every signal, sometimes by a hair, sometimes by a wide margin, with a lower noise floor and stronger apparent reception. Only the E5/G5 outperformed the Satellit on a few signals by just a hair but they were very, very close, and would be hard to distinguish under most conditions. The Satellit is the best of the current crop of midsized portables on AM. The Satellit has the usual multiple bandwidths, and with the Up/Down buttons you can easily move up and down, back and forth through the bandwidth selections without having to scroll all the way through them…very quick and convenient. DSP IF filtering is one area in which DSP sets excel with not only more bandwidth choices but also better filter characteristics than comparable portables with standard filters. This means phenomenal selectivity with best possible frequency response at any given selectivity setting. The Satellit’s AM was also refreshingly free from any DSP artifacts…indeed the newest crop of DSP-based radios seems to indicate that the manufacturers have finally learned how to filter the digital noises which ruin the AM one earlier DSP sets. SW Reception: Here the Satellit performed very well compared with the other same-size portable radios on most signals although my notes show it did out pull them on a few stations – excellent performance. This radio has very good SW whip sensitivity in this class. However it rather expectedly fell short when I compared it with the E1, SAT 800 and even the lower priced C.Crane CC-SW which slightly edged it out…all on whip antennas…it just was not quite as sensitive as those as you would expect. And The Not-So-Good News: A new radio carrying the Satellit name should live up to the reputation that name plate has earned over the past 50 years. I therefore felt compelled to compare the new Satellit with my Satellit 800 and Eton E1 using my Wellbrook ALA-330S Loop Antenna, a 40 foot random wire, and with built-in antennas. The external antenna tests were only done on SW as the new Satellit’s Aux Antenna jack does not work for AM…a serious omission for many users. But it was no contest on SW…the SAT 800 and Eton E1 trounced the new Satellit on raw sensitivity, sound quality in sync mode, sync lock width, selectivity, Fast and Slow AGC settings not available on the new model and overall tuning and listening performance. Several signals which were barely detectable traces on the new Satellit were much easier to hear on the larger radios. On the Wellbrook there was noticeable overload at night although it was remedied by use of the Local/Distant switch. There was no overload noted with a 23 foot reel-up antenna. Beware Of Single Station Comparisons: One thing I cannot stress enough because many people overlook it is that you must compare radios on as many signals as possible…on any given test signal one radio might outperform another, yet if you changed stations the results can reverse. I see this all the time which is why I tabulate the results on as many signals as I can up and down each band. Also, when comparing two radios on buit-in antennas you should frequently swap their positions..very often a weak signal will favor one location and either radio will sound best when put in that particular spot. SSB: The new Satellit is excellent in SSB mode. With its combination of USB/LSB selection plus 10 Hz tuning steps in Fine Tuning mode it was easy to clarify strong and weak SSB transmissions, and the results were particularly good with natural sounding voices. Overall SSB reception and sound are excellent by portable standards. 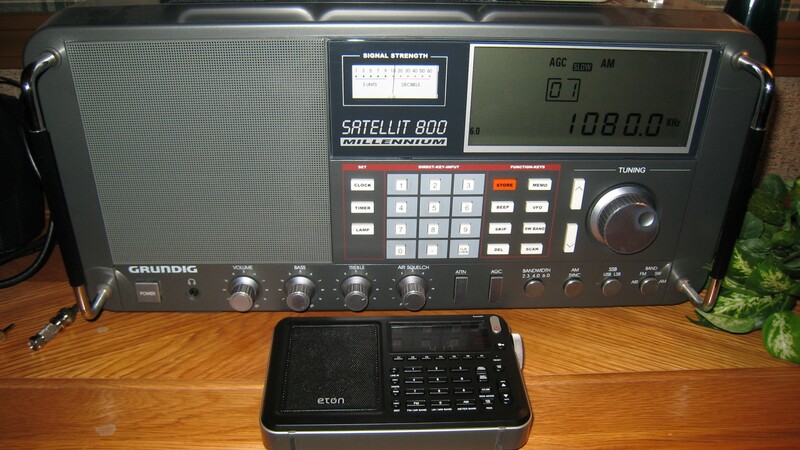 The E1 and SAT 800 can outperform it in SSB mode but none of the other portables could. The SSB Fine Tune mode makes clarifying SSB signals is as easy as it can be. Another note about the SSB Fine Tuning: The Fine Tuning mode in SSB allows a +/- adjustment away from the center of the tuned frequency. Remember to always return this control to “0” before exiting SSB mode because this offset does affect tuning in Sync mode. Aux Antenna Jack: While it is unfortunate that the antenna jack work does not work for AM, there is also a peculiarity associated with it if your antenna has a grounded shield lead-in as you might have with an external antenna. If you only plug the antenna plug in partially you get a lot more gain than when the plug is fully inserted… the result is similar to clipping it to the rod antenna. I decided to try using a stereo plug (a standard 1/8″ stereo mini-plug) instead of the usual mono plug and the results were surprising. Connecting the hot (signal) lead of my antenna to EITHER the Tip or the Ring of the stereo plug and the shield to the sleeve as usual I was able to get full signal into the radio. You can use a mono plug partially inserted but this is clumsy as it tends to move and fall out if you move the radio, or you can use a stereo plug for your antenna. The even better news is that this is not a problem with a simple wire antenna or any antenna that does not have a grounded shield, such as the popular reel up antennas, a plain wire antenna or an indoor loop like the Sony ANLP-1 or the Degen SW loops…they all work fine with their mono plugs. The issue only happens if the shield of the lead in is grounded and if that’s the case the simplest solution is to obtain a stereo plug and connect the shield of your lead-in to the sleeve and the hot lead to either the tip or the ring as I described above and you’ll be good to go. Alternately you can obtain a mono to stereo adapter plug. 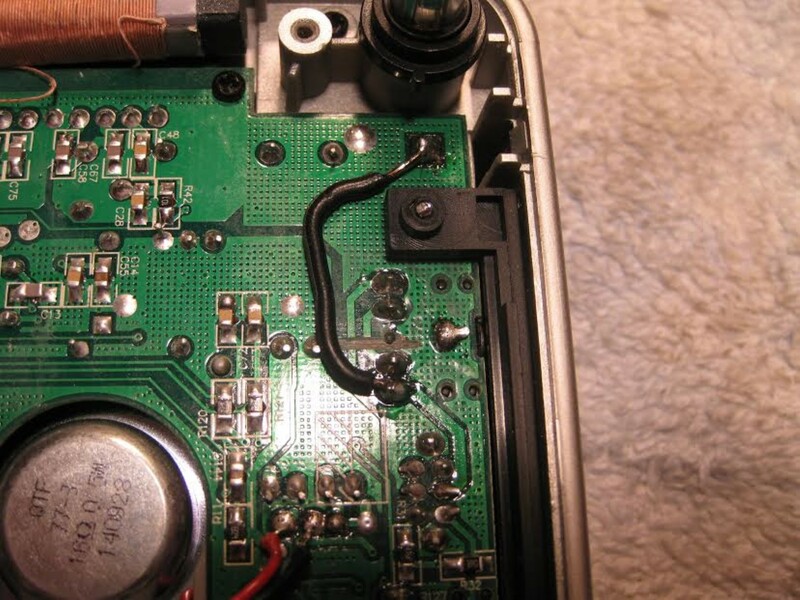 However, a reader has discovered that this is incredibly simple to fix if you are willing to open up the back of the radio. 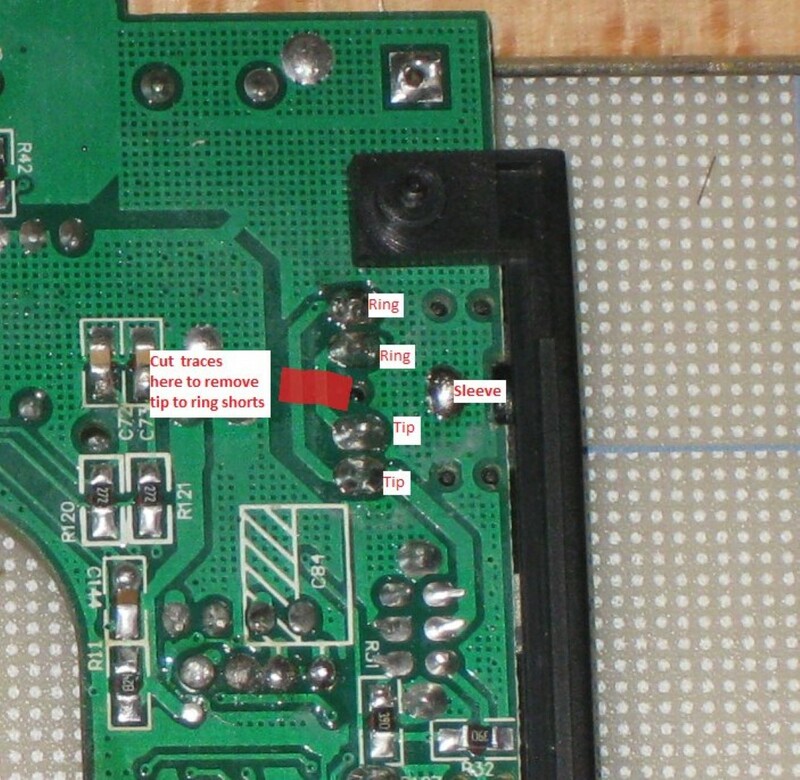 I don’t necessarily recommend you do this as it would technically void your warranty but for the hobbyist who is not afraid to tinker here are his step by step instructions with pictures showing how to do it. 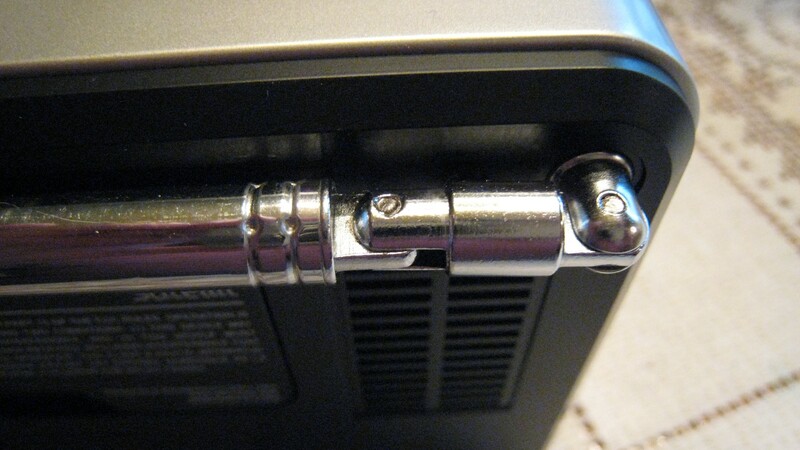 The jack Eton used is a 5 pin stereo jack with 1 pin as the sleeve, two pins as the Tip, and two pins as the Ring. 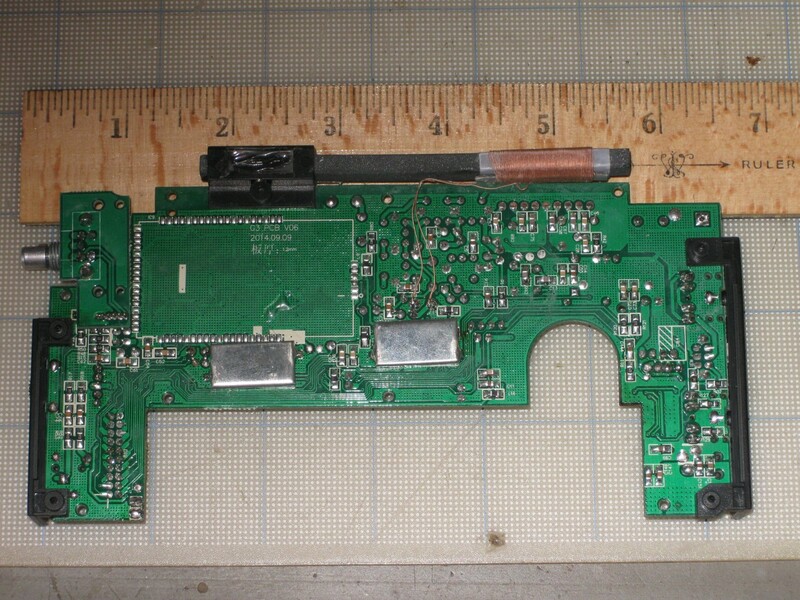 As can be seen from the photos, Eton layed out the board to add two traces to make the Tips and Rings common. The problem with this arrangement is that if a mono plug is inserted, the sleeve of the plug will contact the Ring leads in the jack, As the Tip and Ring leads are common, when you insert a mono plug then the sleeve, Tip, and Ring leads are shorted together. While you can use a stereo plug or a mono plug with a stereo adapter to work around this, a more permanent solution is to simply cut the two traces which are connecting the Tip and Ring leads together. This will leave the Ring lead unconnected, or floating, The Tip leads are connected to the LNA input, so no other circuit modifications need to be done to make this work. I did the mod this morning, and the mono plug on my external jack works just fine now. No more stereo adapter plug required! 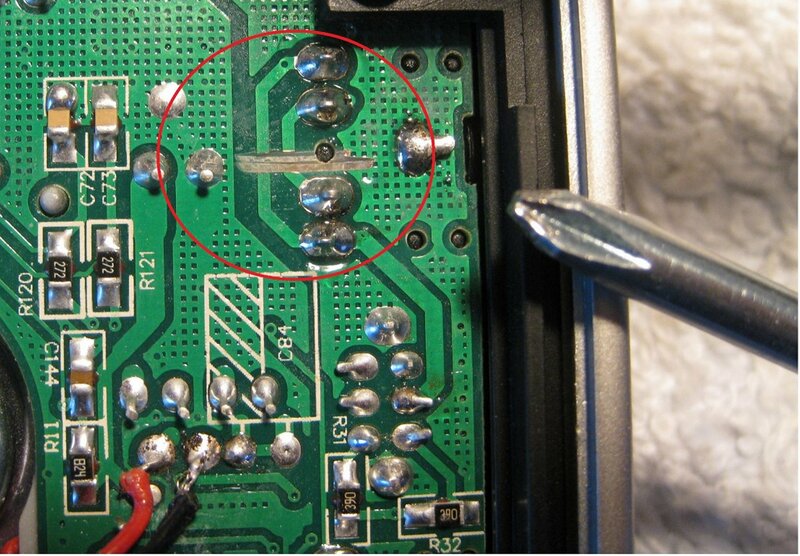 However you must also add a jumper to re-connect the whip antenna…see the third picture. These photos show the traces to be cut and the jumper that needs to be added. This is a simple mod. 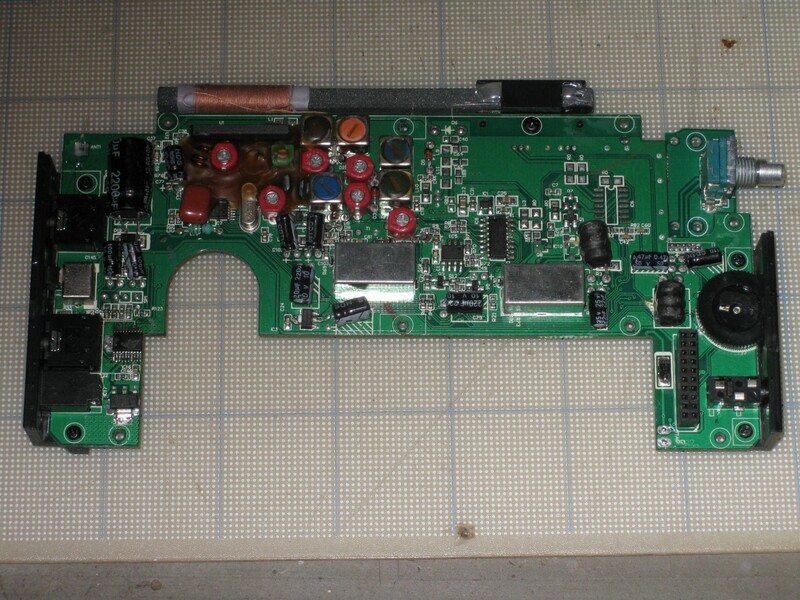 You take the batteries out of the radio, then remove the 4 screws in the rear cover, one in each corner. The rear cover snaps in as well, so after you remove the 4 screws you will have to pry the rear cover up and pop it off. The antenna is mounted in the radio, so you straighten the whip out so it is perpendicular to the rear cover, then slide the rear cover off. No further disassembly is required as the necessary board is now exposed and ready to be modified..
FM Reception: Another high spot…the Satellit with its modern DSP design is a superb FM performer. It showed excellent sensitivity and selectivity and is up there with the best modern portables I have tried. 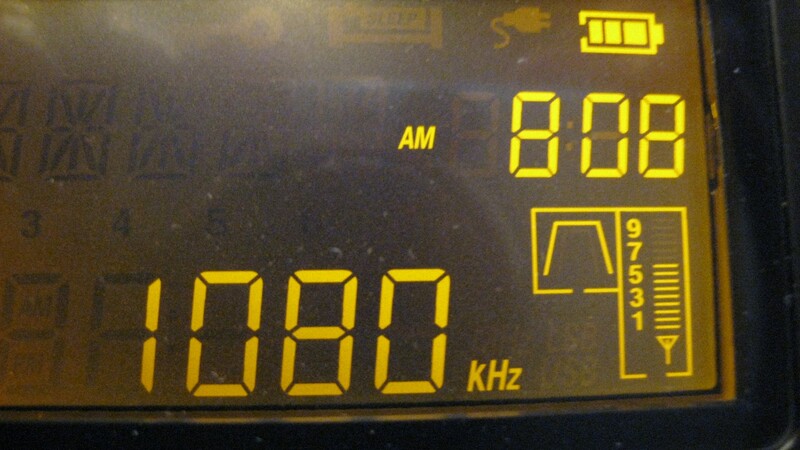 RDS is another feature FM fans will enjoy and the Satellit seemed able to lock onto even weak RDS signals. I ran side by side comparisons with other radios known to have top tier FM reception, including the Tecsun PL-880, PL-660 and CC Radio 2E. They were so close it would be hard to say that one was better than the other. I did some very tough tests…at my hillside location I found several frequencies where two (occasionally three) weak signals could be received by moving the antennas and the radios. In almost every case it was impossible to distinguish any meaningful differences…all three are as good as I have ever seen and in terms of selectivity, better than most older portables. 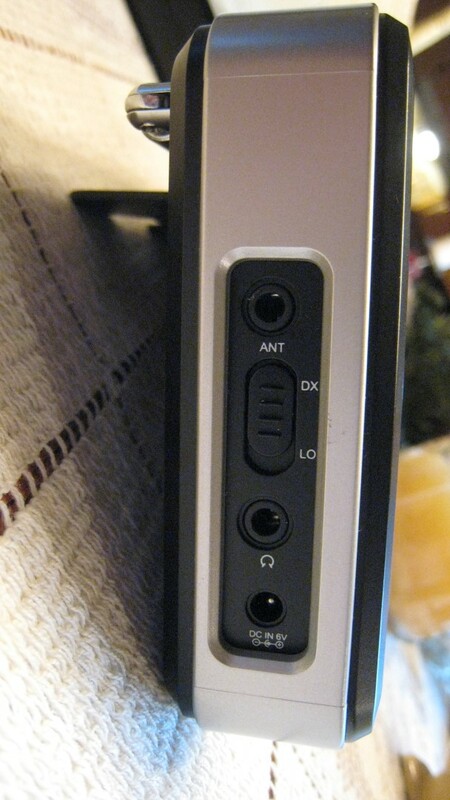 One nice feature is instantly accessible Stereo/Mono switching in FM mode without having to get into any menus…be sure to set it to mono when using the speaker…the speaker does not receive a mono mix when the unit is in stereo mode so only 1 channel is heard which means that you will be missing one channel of the audio and weak and noisy signals will sound clearer when set to mono. Air Band: The Air Band worked well with good sensitivity. I programmed in some frequencies from my local airport about 15 miles away (airport frequency info is easily found online) and was able to hear many communications clearly. Comparing it with the few other radios I have which offer Air Band the Satellit was as good or better than the others. Synchronous Detection: Here again the news is not so good. Although the sync locks well and there were no problems with popping in and out of sync as with a few previous portables such as Eton’s G3, the sound in sync mode is poor. My sample does not have the distortion others have reported, but for some reason the frequency response is so lopped off on both top and bottom that all that remains is midrange. Speak into your cupped hands…that’s how the Satellit sounds in sync mode. So while it can be used to reduce fading and increase selectivity, the sound will make it likely to be little used unless Eton can resolve the problem in the future. Just a with the Tecsun PL-880 it is difficult to understand why this has happened and it is a shame. Muting While Tuning: As of September, 2015 the newest production run of the Eton Satellit has reduced the muting while tuning which the original release had which now makes band scanning much more enjoyable. It is completely disabled during SSB mode which is good news. On SW the new version has almost no muting at all and it therefore band scans very nicely. On AM it is still a bit intrusive…the audio is not totally muted but it is lowered in volume during tuning so if you can hear what you are passing by. Again its not as nice as on SW but it is improved over the earlier version. Although not ideal I can live with it because the actual reception on AM is better on the Satellit than any of the other current production mid-sized radios I’ve compared it with. 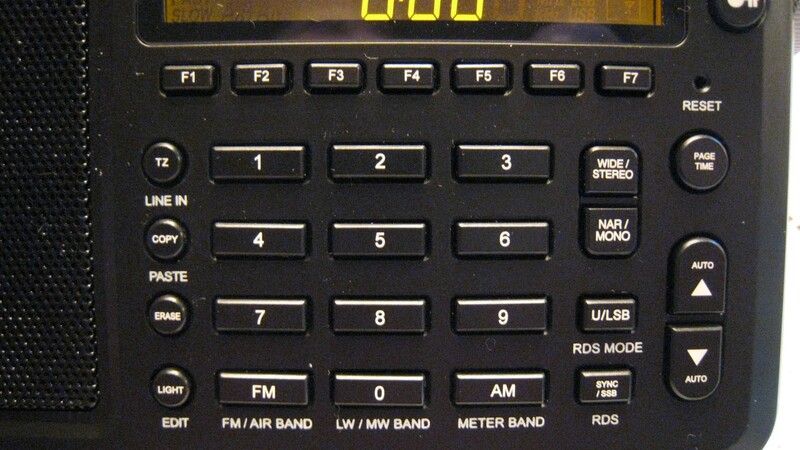 How To Tell If You Have The Updated Version/Checking The Firmware Version: With the radio OFF, press the “0” (Zero) button and hold it down for 10 seconds. Then hit the Reset button using an opened paper clip or similar tool. The revised firmware should display as RBDS 003. If you have the older version Eton will replace your radio with an updated version…contact Customer Service for a Return Authorization. (Note: This info has been called into question as one reader emailed me that his original production unit also reads RBDS 003 as does his updated replacement. I have asked Eton Customer Service about this but so far they have not replied to my inquiries). Sound Quality: The Satellit has great sound quality for its size. It sounds much nicer than the larger PL-660, and approaches the sound quality of the PL-880. It sounds far, far better than the old benchmark, Sony 7600GR. On AM and SW you have considerable control using the 5 bandwidths…however, on FM, although the sound is quite pleasing, there is no tone control whatsoever…another unfortunate omission. I note that Eton’s list of specifications include bass & treble controls but alas, they are not present. Comments & Conclusions: Well…in some ways this is one of the most difficult conclusions I’ve ever had to write, more so because of Eton’s marketing strategy than the design and performance of the new Satellit radio itself. This new Satellit is overall a nice package and a good performer in the realm of small to medium size portable radios with which it competes. As all radios do it has strengths and weaknesses…no radio is perfect. None of the other radios in its category (the Tecsun PL-660, PL-680 and PL-880, the Eton E5, Sony 7600G/R series or Sangean ATS-909X) outperform it overall although some outperform it in certain areas. The Satellit is notably strong on FM/AM, SW, and SSB reception, has superb IF Filters and very nice sound quality for the size. It offers strong performance overall. Unfortunately I can’t help but compare the new Satellit with the “real” Satellits of old, such as the venerable Satellit 208/210, 600/650 and 700 series, and the more recent yet still capable Eton/Grundig SAT 800, E1 and to a lesser extent the SAT 750. Unfortunately the new Satellit simply is not in the same category as those radios which not only cost much more (again excluding the 750, they cost more than double the price of the new Satellit), but performed better in many ways and offered more facilities and amenities. It appears that Eton is cashing in on the Satellit name while changing the design concept completely. However, I do feel badly that many will underrate this radio because of this and I think that is a shame, because if the new radio were called anything but a Satellit, I would feel it lived up to my expectations as a new, top of the line portable radio. It does match or outperform the other portables I compared it with, and although a bit pricier has a good feature set with both Air Band and FM RDS. Overall it is a nice radio, and I am going to enjoy owning it…but I am sorry to say that it never should have been called a Satellit. Click link below to see it at Amazon.